On down the Beagle Channel early the next Day. The weather worse than it was the day before.. 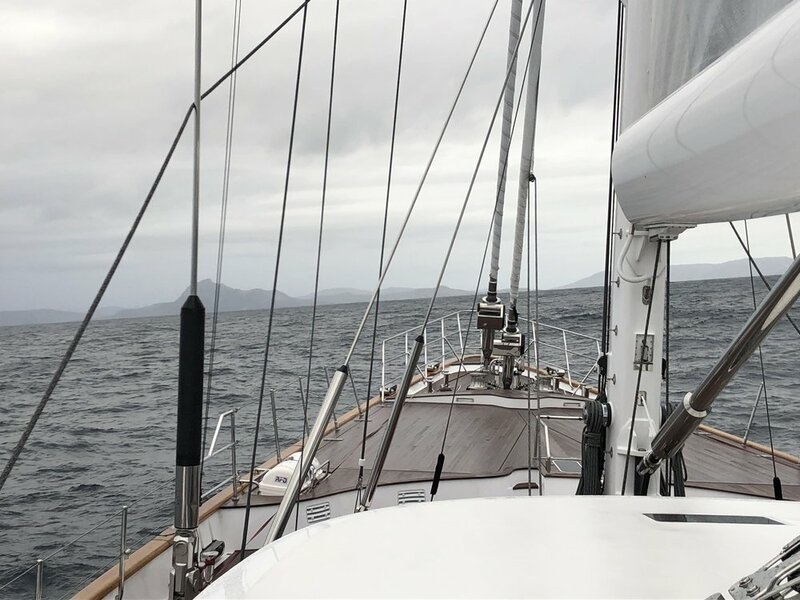 Very little vis, snow squalls and winds in the 30’ and 40’s oh joy…However as we approached the very narrow navigable entrance..(it is wide looking, However we only float in 100m of it) With Radar ranging We could see how we needed to approach. and in right before the weather shut down again transiting in on the old reliable radar index line. 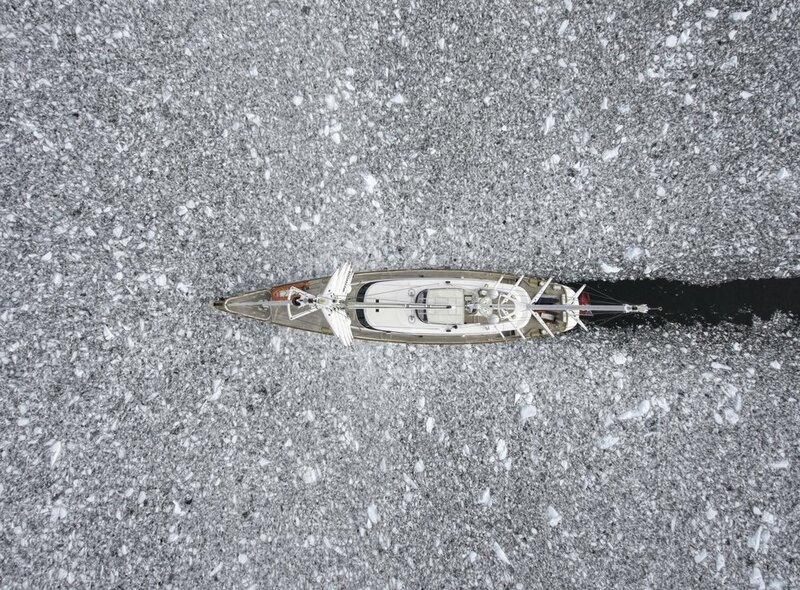 Once inside the weather cleared and we headed 6nm up the West Arm of the Pia Glacier.. It was stunning and we got quite close. Camera time. great Colours.. So the trip across..What to say. It was certainly as rough as our trip down, more wind and bigger seas but on the beam. So 2 reefs in the Main and the Staysail and we averaged 11kts. Winds to the mid 40’s made it seem all too real.. The 7.0m and 25’ seas were fairly daunting but the Albatross flying around kept our attention. The trip over took about 60 hours as we were trying to time our arrival at the Horn between two lows. Somehow We made the target. 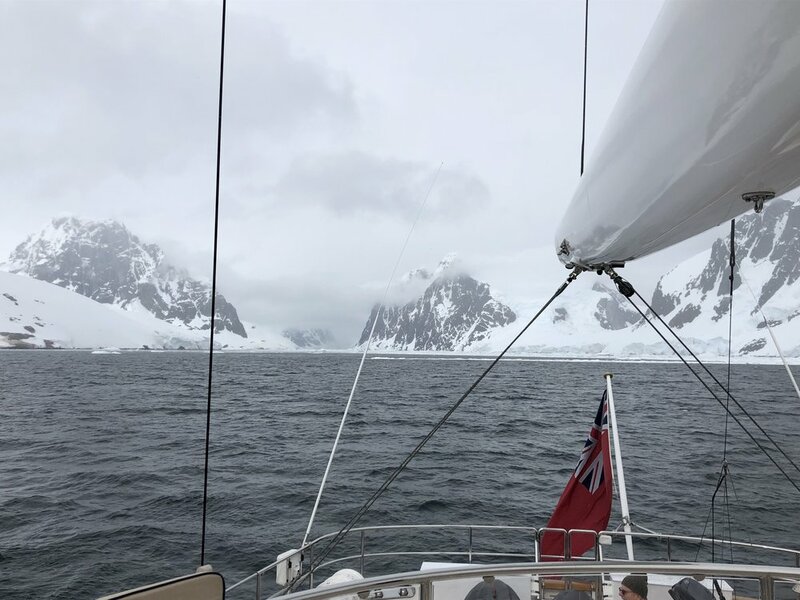 We left Paradise Bay for the Melchoirs where we wanted to prep the boat for the trip 200nm South to the Antarctic Circle. The trip over to the Melchoirs was not bad for ice but as we approached the entrance we found this most beautiful Ice berg stuck in the channel. We had to creep around it in the shallows to get in. The spire was much taller than out 60m , 200’ masts.. and without the masts Rosehearty would have fit through the hole..
We found a group of seals and Penguins hanging out on a floe and nudged Rosehearty up to it and they, the inhabitants could not have cared less..
Actually it looks worse from the bridge than it does up here. But this is about max for us. Palmer Station is the only Northern peninsula Base that is US operated. It is the real deal. All year round and real science. We all loved the experience, and the trip there and back to Lockroy was a real challenge through ice but we did get it done. After the visit to the Station we had a great trip ashore and saw Sooo…many Penguins.. There are a few of these old bases around.. mostly decaying. However here We got a nice walking tour, and better yet into the gift shop. Where yes they do take credit cards.. Going back to the Family.. In Wilhelmena Bay we had a terrific experience with a Humpback family. While Mom and baby Napped on the Surface, Dad we think, came over and gave us a show..Literally right under and around the boat for 15 minutes. Then just at the end he Spy Hopped to check us out face to face...and then satisfied he had done a good job with his Audience he dove away..
We decided to make sure We were familiar with the Tent set up of which We have 4 and fit everyone to there sleeping bags etc. Better to do now than in the wind and with Mittens on. These new Tents from Northface take 10 minutes to get together including the waterproof fly sheet. The plan to camp ashore for a night..